In the first federal bribery case involving a sitting senator in 36 years, the trial for US Sen. Robert Menendez (D-NJ) starts this week in Newark federal court. U.S. Senator Bob Menendez’s federal bribery trial – the first for a sitting senator in 36 years – begins this month. 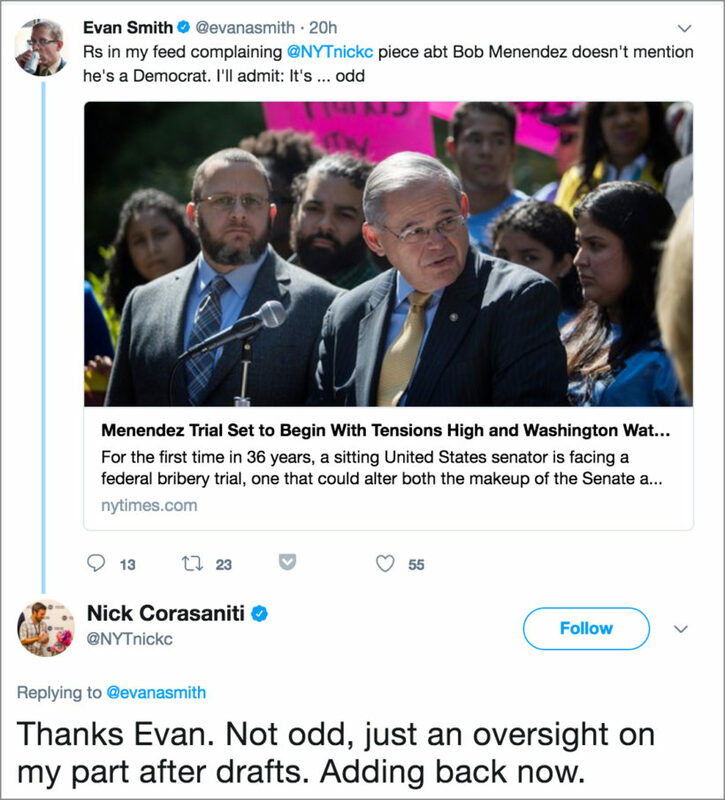 In a New York Times article nearly 1,300 words long about the trial, writer Nick Corasaniti did not once mention that Senator Menendez is a Democrat. Corasaniti replied to one tweet Monday evening and noted Republican complaints about the omission, saying it was an “oversight.” The story now states in the fourth paragraph that Menendez is a Democrat, but does not note that the article was updated to include this identification. The reporter referred to Menendez 29 times in the story, without once ever mentioning that the senator is a Democrat. 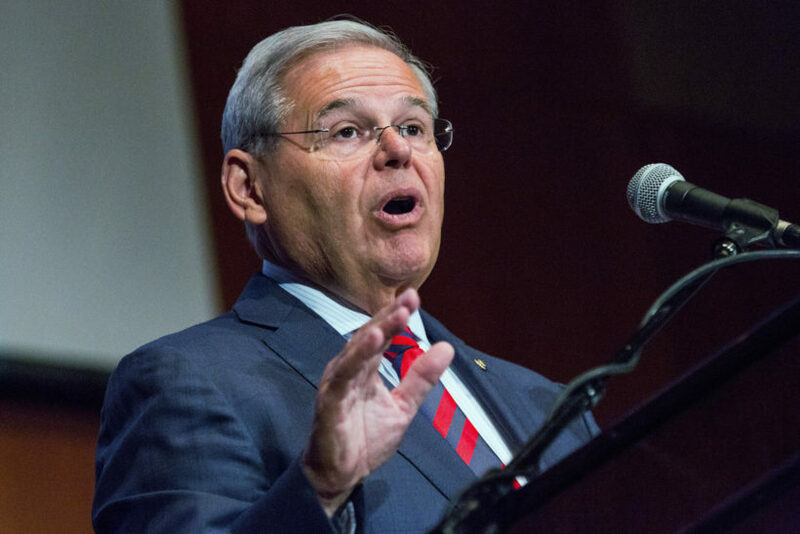 The paper referred to him as “The senator,” “Senator Robert Menendez of New Jersey,” and “Mr. Menendez, a senior senator,” before referring to him as “Mr. Menendez” or “the senator” for the rest of the story. Only after a barrage of online criticism did the NYT note that Menendez is a Democrat, adding in the identifier in the fourth paragraph. It appears the NYT was able to fix the error before Tuesday’s paper went out. By Tuesday morning, however, neither the NYT’s online nor its print coverage noted that the story had been changed to include Menendez’s political affiliation. 1. What type of media bias does the excerpt illustrate? And your editor also happened to have the exact same “oversight” as you did?? Adding back? So it was originally in, then removed, now back. Odd. If he was a Republican it would of been blasted all over the headline! a) Is including the party affiliation of a U.S. Senator (or U.S. Representative, Governor or mayor) basic journalism? Explain your answer. b) Do the twitter users above have a point, or do you think omitting Senator Menendez’s Democratic affiliation was just an oversight on the part of the reporter and editor? Explain your answer. c) Should the Times have noted that the article had been updated to include Senator Menendez’s political affiliation? 1. Bias by omission. – and, if you believe the omission to be intentional, then bias by spin also. 2. a), b) and c) – Opinion questions. Answers vary.